How good were you in your studies ? ~ at School, if Geography was boring, Mathematics was difficult .. . .. and language grammar was perhaps toughest !! – ever read the one below .. .. or knew at least that something existed ! 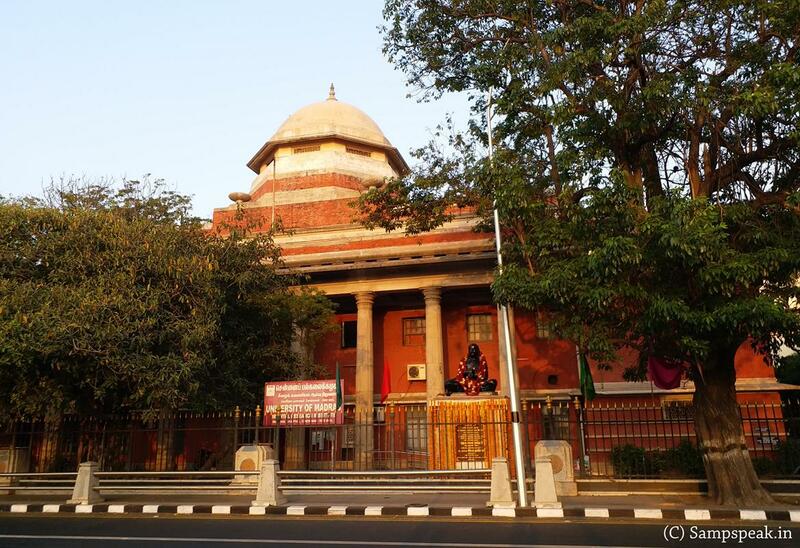 In 2013, President Pranab Mukherjee presented the ‘Presidential Awards for Classical Tamil’ for the year 2009-10 and 2010-11 at a function in Rashtrapati Bhavan. While the Tolkappiyar Award for lifetime achievement in classical Tamil was awarded to Dr. Iravatham Mahadevan and Prof. Tamizhannal Periakaruppan for 2009-10 and 2010-11 respectively, the Kural Pitam Award was given to Dr. Jaroslav Vacek and Dr. John Ralston Marr. .. .. .. sure have heard of Tolkappiyar ~ ever imagined how would he look like ?? On Saturday, it was the turn of Chief Minister Edappadi K Palaniswami to pay a ‘courtesy call’ on Captain and enquire about his well-being. The CM, who is also the joint coordinator of the ruling party, took along senior ministers Sellur K Raju, Dindigul Srinivasan, C Vijayabaskar and Kadambur Raju with him to share warmth with the DMDK chief and pose for pictures. Edappadi K Palaniswami was perhaps a dark horse ~ not many would have thought of him as a Chief Minister, a couple of years back .. .. but when Ms J Jayalalithaa, breathed her last – he rose as a compromise candidate and assumed office on 16 February 2017. Mr Palaniswami has won the assembly election to the state assembly four times, in 1989, 1991, 2011 and 2016 from the Edapadi constituency. 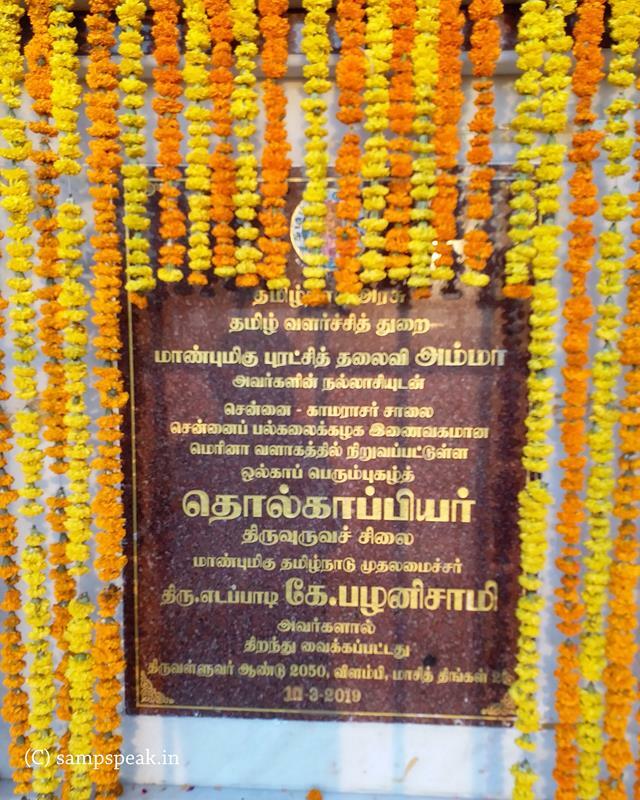 In addition, he won the Lok Sabha seat from Tiruchengode constituency in 1998.. .. this is no post on Mr Edapppadi’s political fortunes or on how he brought about a formidable alliance for the present Lok Sabha .. but on a statue unveiled by him recently. சென்னைப் பல்கலைக்கழக இணைவகமான மெரினா வளாகத்தில் நிறுவப்பட்டுள்ள ஒல்காப் பெரும்புகழ்த் தொல்காப்பியர் திருவுருவச் சிலையை முதலமைச்சர் எடப்பாடி. கே.பழனிச்சாமி அவர்களால் திறந்து வைக்கப்பட்டது. 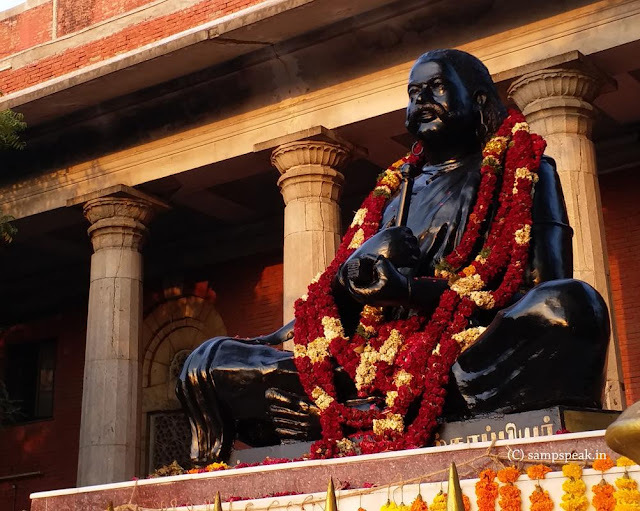 ~ again not many would have read Tamil Nadu Chief Minister unveiling a statue at University Annexe – Oriental research Centre at Marina .. .. the beach Road (named after CM Mr K Kamaraj) has many many statues – Kambar, Ilango, triumph of labour, Barathiyar, Kannagi, Nethaji, Thiruvalluvar …. and on the other side – Vivekanandar, Annie Besant .. .. and .. Tolkappiyar ! ~ yes, the recent addition. 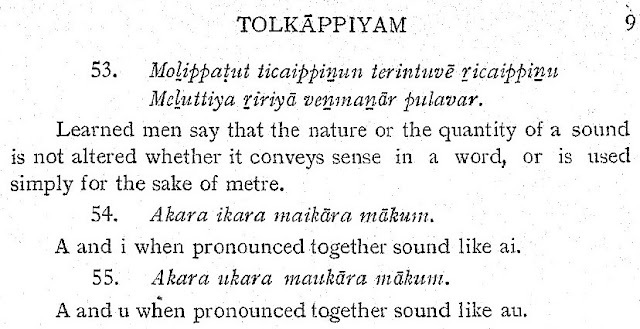 Tolkāppiyam derived from the combination of two words: Tonmai ("ancientness") and kāppiyam ("literature"). The derivation of Tolkāppiyam from the root words is as per the rules defined in Nannūl verse. தொல்காப்பியம் (ஆங்கிலம்: Tolkāppiyam) என்பது இன்று கிடைக்கப்பெறும் மிக மூத்த தமிழ் இலக்கண நூலாகும். இது இலக்கிய வடிவிலிருக்கும் ஓர் இலக்கண நூலாகும். 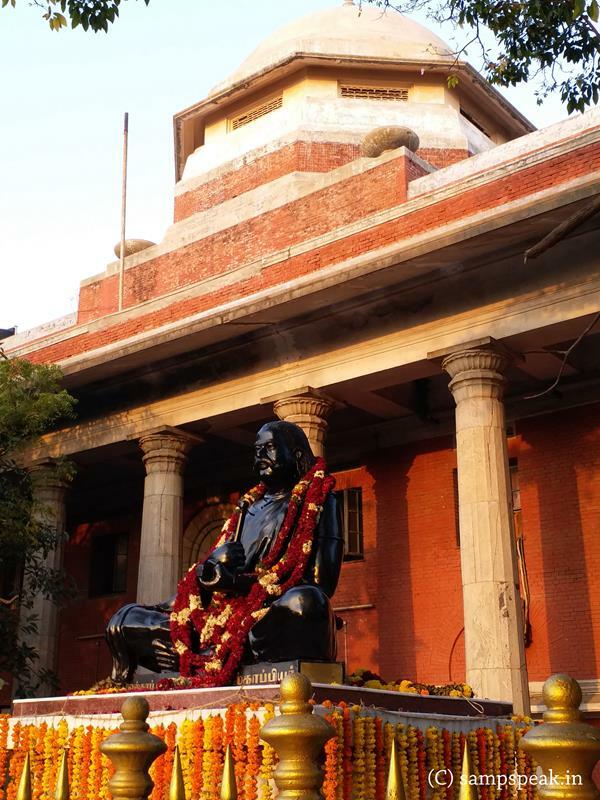 இதை எழுதியவர் தொல்காப்பியர். தமிழ் இலக்கண விதிகளுக்கு அடிப்படையான நூல் இதுவே.தொல்காப்பியத்தை முதல்நூலாகக் கொண்டு காலந்தோறும் பல வழிநூல்கள் தோன்றின. தொல்காப்பியம் எழுத்து, சொல், பொருள் என்று 3 அதிகாரங்களாகப் பகுக்கப்பட்டுள்ளது. எழுத்ததிகாரமும், சொல்லதிகாரமும் தமிழ்மொழியின் இயல்பைக் கூறுகின்றன. பொருளதிகாரம் தமிழ்மக்களின் வாழ்வியலைக் கூறுகிறது. வாழ்வியல் நூல்கள் எவ்வாறு அமைந்துள்ளன என்பதையும் விளக்குகிறது. 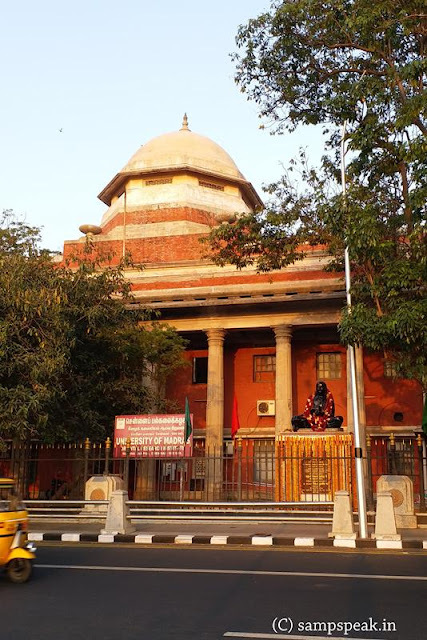 பொருளதிகாரத்தில் 9 இயல்கள் உள்ளன. Tholkāppiyam is a work on the grammar of the Tamil language and the earliest extant work of Tamil literature and linguistics. It is written in the form of noorpaa or short formulaic compositions and comprises three books – the Ezhuttadikaram ("Eluthu" meaning letter), the Solladikaram ("Sol" meaning word) and the Poruladikaram ("Porul" meaning definition). Each of these books is further divided into nine chapters each. While the exact date of the work is not known, based on linguistic and other evidence, it has been dated as early as 5th century BCE. Tholkappiyam categorises alphabet into consonants and vowels by analysing the syllables. It grammatises the use of words and syntaxes and moves into higher modes of language analysis. Tolkappiyar’s name was Trnadumagni and he was one of the 12 disciples of Agastya. 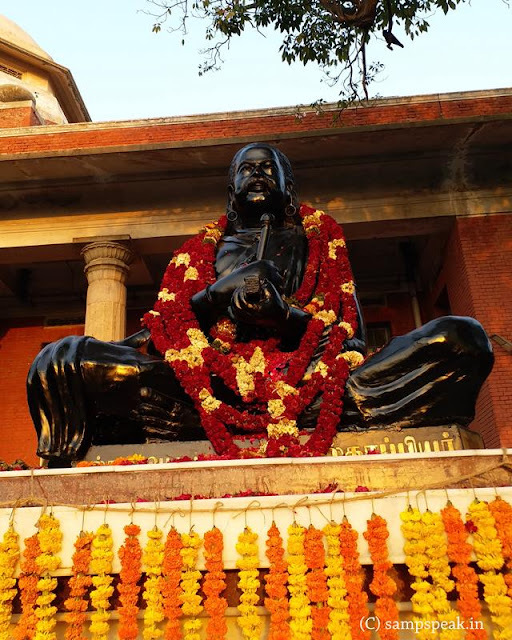 Dr. P. S. Subrahmanya Sastri (1890 – 1978), a Sanskrit scholar, who also acquired mastery over Tamil languageand literature, was the first to translate Tolkāppiyam into English. Here are some photos of the statue of ‘Tholkappiyar’ ~ unveiled on 10th Mar 2019. ~ not many newspaper / media reported on this .. .. could not understand why !